The morning sun filtering through the rainforest foliage at Playa Nicuesa Rainforest Lodge in Costa Rica shimmers gold as the light catches the strands of the complex web woven by a golden orb spider. I'm generally not a big fan of spiders, like most people, but the golden orb is fascinating. These large spiders weave enormous pigmented webs, adjusted in color for camouflage, with protecting chemicals, and such incredible strength and elasticity that bioengineers and other scientists are studying ways to mass-produce their silk. The spiders are widespread in warmer regions around the world â€" the Americas, Australia, Africa, India and Southeast Asia. They are the oldest surviving genus of spiders, with a fossilized specimen dating to 165 million years ago. You can find golden orb spiders hanging out in their shimmering webs everywhere around Playa Nicuesa Rainforest Lodge and along the trails. Threads of their webs shine like gold in sunlight. Studies suggest that the silk's color may serve a dual purpose: sunlit webs ensnare bees and other insects that are attracted to the bright yellow strands, and in the shade, the yellow color blends in with background foliage to act as camouflage. Golden orb spiders can adjust the webâ€™s pigment intensity relative to background light and color. They also secrete a chemical â€" pyrrolidine alkaloid â€" on the strands that protects the web from ants. The fine-meshed spiral webs are gigantic: they can span 20 feet tall (6m) and 6.5 feet wide (2m). When you look at a web, you canâ€™t help noticing the female spider since she is huge; golden orb females reach sizes of 4.8â€"5.1 cm (1.5â€"2 in) not including leg span. Those little spiders on the web are the males, being usually 2/3 smaller (less than 2.5 cm, 1 in). If you should doubt the strength and elasticity of a golden orb weaver web, walk into one. Youâ€™ll find it is not easy to remove. When walking the trails at Nicuesa Lodge, I always watch out for golden orb webs â€" they are beautiful to admire, and you want to avoid being covered in the sticky silk. While the spiders rarely bite humans, their venom is potent with a neurotoxin effect, though not lethal to humans. 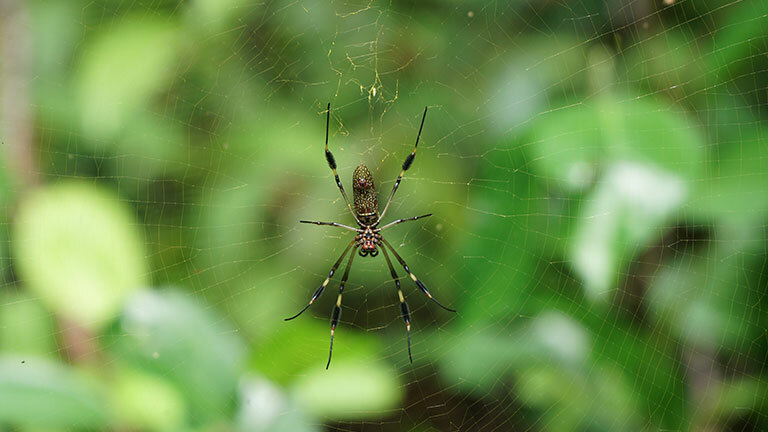 During your visit to the unique Costa Rica eco lodge at Playa Nicuesa, be sure to look out for these amazing eight-legged wonders. Capturing the morning or afternoon sunlight on their webs produces beautiful photos.